Happy Friday, guys! Can you believe we have less than a week until Christmas? It was just Halloween then Thanksgiving flew by, and now Christmas is upon us and here in Eastern Washington we have no snow on the ground which makes it even harder to believe. This time of year, when it’s chilly outside, I love making easy crockpot meals. 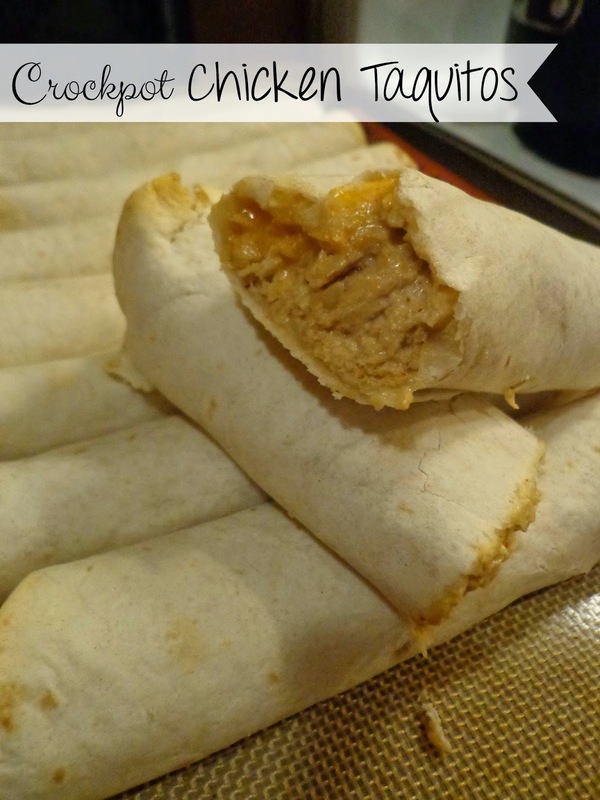 I love putting something together like these Chicken Taquitos, that is so easy, yet delicious. Especially because it gives me so much more time with my family. I love to cook, but I don’t like spending all day in the kitchen, and no time with my kiddos! Shortly before serving shred chicken with two forks. Cook about 15 minutes longer. Preheat oven to 400. Place ¼ cup of the chicken mixture onto each tortilla. Sprinkle with shredded cheese. Roll tightly and place on a greased baking sheet. Bake 10 minutes, until tortillas are slightly browned and shredded cheese is melted. You could certainly dip these babies into a lot of things, but we dipped ours into a little bit of ranch dip and it was yummy. Also, I only had 10 tortillas and mine were way too full. I think I could have easily 15 or maybe a couple more and had them more of the right size, because ours were heaping! Have any family over in the next few days? Make these up because everyone will enjoy them!